It is that time of year again. Tis the season for hot chocolate, fuzzy socks, red and green coffee cups, and all the moisturizer you can get your hands and hair on (We all know how this weather can dry up your curls). So as you are exchanging Secret Santa gifts at your job and checking your family’s Christmas list…twice, share with another natural the gift of hydrated, perfect curls. Here are a few gifts that are most likely on every natural’s Christmas list. 1. Diffusers. Can’t go wrong with one of these babies. Everyone wants that perfect wash ‘n’ go but without the frizz. Diffusers help eliminate that while bringing an elongated and defined look . Pay attention to some of her favorite natural Youtube vloggers and see which diffusers they are using. I recommend buying a regular blow dryer, and going to a beauty supply store and buying an attachment there. Feel free to throw in a matching heat protectant while you’re at it. 2. Natural Hair Expo. I cannot speak from experience, but I can speak through referrals. I always hear great reviews from people who attend Curls over Brunch or natural hair expos. It can be a ladies night out where you and your girlfriends rent out an apartment in the city and attend a natural hair event during the day and do dinner and drinks at night. Tickets are usually not very pricey, but make sure to get them early because they always, always sell out. 3. A Gift Basket of Hair Products. Shea Moisture, Mane Choice, Carol’s Daughter. There are so many brands out there with incredible lines. Pick one that she has been wanting to experiment with. Choose a line and create a gift basket with all the products from that line. Choose a shampoo, co-wash, leave-in conditioner, oil or serum, and a deep conditioner. TIP: you may want to double up on the deep conditioner, after all it is winter. Buy a woven basket from Hobby Lobby or Target. Pick up some clear tissue or wrapping paper and a bow. After placing all the products in the basket, wrap the basket with the paper making a knot at the top and place the bow around the knot for a cute presentation under the tree. 4. Gift card. When in doubt, gift cards NEVER FAIL. If you are afraid she may have all of the above or she may not like what you picked out, a gift card to ULTA can definitely do the trick. 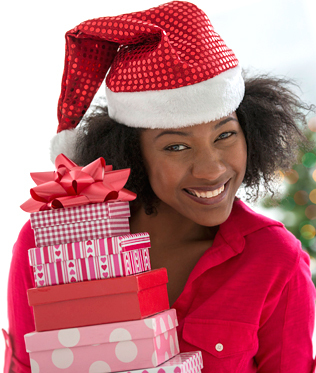 Hopefully these tips above can make the rest of your holiday shopping a bit easier. Another tip: stay updated with sales, discounts, coupons, and giveaways on social media. Many companies use this time to reach out to all of their customers, so stay on your toes, or should I say finger tips, so that you can buy all the best gifts without breaking your wallet. Is Natural Hair for Everyone?